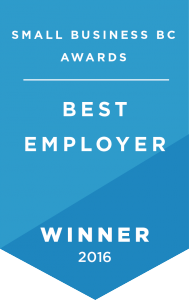 We are happy to announce that we won Best Employer in this year’s Small Business BC Awards! We congratulate all the other finalists and are grateful to be part of a supportive small business community. This award is a testament not only to our strong leadership who works tirelessly to ensure our team has everything they need, but also all the great employees who look out for each other, thereby contributing to a safe and supportive working environment. Check out this video, where our CEO Kevin Webb explains how this award reflects the teamwork that is present on every job. Thanks again to everyone who voted for us, and to Small Business BC for the award and recognition! We are hiring! Come and work for one of BC’s best employers – check out our career page here.